The Dhakeshwari Temple, Dhaka or popularly known as the Ðhakeshshori Jatio Mondir in the native language is a popular place which draws loads of tourists from various places. The Dhakeshwari Temple in Dhaka is a famed Hindu temple in Dhaka which as a mater of fact is one of the most pious places fro the Hindus in the city as well. The temple is state owned and is a major tourist attraction of the city. The Dhakeshwari Temple in Dhaka is applauded with the laurel of being the Bangladesh's "National Temple". The location of the Dhakeshwari Temple, Dhaka places it in the southwestern direction of the Salimullah Hall of Dhaka University. 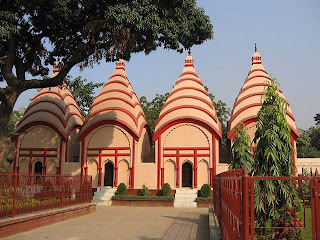 The Dhakeshwari Temple, Dhaka has gained in importance more after the destruction of the Ramna Kali Mandir in 1971 during the Bangladesh Liberation War by the Pakistan Army. The place is truly the most important place of worship for the Hindus in Bangladesh. Travelers coming to Dhaka should never miss the opportunity to visit the Dhakeshwari Temple, Dhaka whileon a trip to Dhaka.